Supposedly more will be revealed next Tuesday. There's some sort of marketing push. I'm hoping since infinity ward has had more than 2 years to make their newest installment....there may be some cool new features. 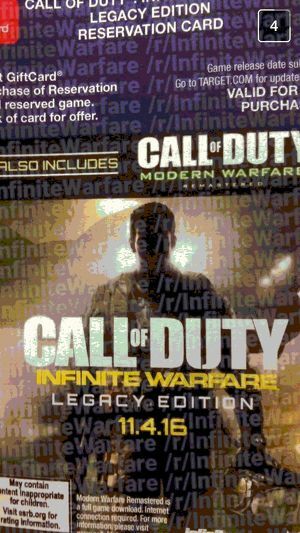 If this is on the money, a "Legacy Edition" includes a remaster of Modern Warfare. I'm more interested in the Modern Warfare remastered pictured at the top there than a new CoD game. And WTF is up with the generic titles? Are they even trying? I would be very interested in remasters of all the games in the series (especially the original titles) except for World at War (unless they actually improved the game substantially than what was released). As much as i enjoy the Modern Warfare titles i still would love to see a return to the original WWII setting. So much potential still there. would be cool if there was time travel in this. Which is kind of funny since 7 or 8 years ago people were so tired of WWII shooters. Last I heard it was gonna be set in the far future, even more sci-fi than Advanced warfare. Why is it infinite? Does the game never end? Probably another way of saying "Neverending War", but that sounds like a downer and wouldn't be a market title. I just thought it was a play on words since it's coming from Infinity Ward. And here I thought COD was evolving. Nope, guess not. I really hope it's not sci-fi.....I know people complained of too many WWII shooters when they were the big thing but I would like to see them go back to the modern warfare type style. I thought because CoD is going to have infinite releases. Until people stop buying them, yes. no, seriously... I hope its time travel. Like someone fractured the space/time continuum, so you are playing multiplayer in the future, then the screen goes bright, and you are now playing in civil war times... then another glitch in the timeline and you are playing in WWII era, etc. Sometimes your weapons are transformed into their current timeline equivalent other times you are actually fighting in civil war times with advanced warfare type tech. that's be pretty sweet. I'd be up for some Dino Warfare! Its a platform, play all the damn wars forever! Becauase American's love them some war!